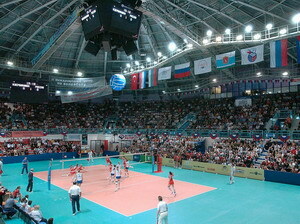 Primary activity of Palace of Sports is holding international competitions in team sports and other demanding audience. A five 5000 seats DIVS game hall is the largest in the Ural and Siberian region. Area Sports Hall – 1720 sq.m. Playing field area – 1004 sq.m. Infrastructure and technical equipment of the main arena of the Palace of Sports allows to hold international competitions in volleyball, basketball, mini-football and all kinds of martial arts, sports and gymnastics, dance sport, tennis. DIVS has hosted within it’s walls representatives of all these sports from different countries and from all continents, and have always received excellent grades only, as the material base and the organization of competitions. It offers cozy locker athletes , coaching and games rooms as close to the playing field . Palace of Sports has a required set of any sports equipment, specialty coatings and equipment that meet the highest international standards. 3 sets of gates: 2 sets — «Mondo» (Italy), 1 set of Russian company.